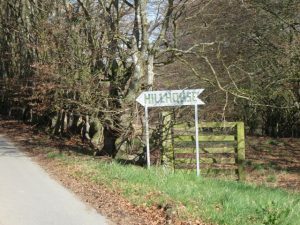 On a beautiful April morning, my friend Val Wilson and I set out to explore Carfrae in Berwickshire and investigate the possible source of its name. Carfrae (Carfra 13th cent.) comes from Brittonic *cajr ‘enclosed, defensible site’ and *bre ‘height, hill’, pronounced *cair-vre. Watson (CPNS 369) interpreted this as ‘hill fort’, but Alan James in The Brittonic Language in the Old North (online at the Scottish Place-Name Society website) explains under bre that it may be an early compound meaning ‘fort hill’. He adds that this may imply ‘a hill with naturally defensive properties, albeit enhanced by man-made works’ (pers. comm.). 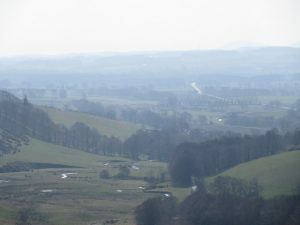 Val and I had already been to Carfrae in East Lothian, some 15 km to the northeast, also in the foothills of the Lammermuirs. A fort is on record there, but has now disappeared, absorbed into cultivated land. It was built on a plateau in a rolling landscape, with a panoramic view to the Forth in the north and with a fairly steep bank to the southeast. The farmhouse sits about 0.5km to the southwest. The name Carfrae BWK is more complicated, because there are two fort sites here, almost equidistant from Carfrae Farm. CANMORE, the archaeological database, lists western site as Carfrae and the eastern one as Hillhouse, after Hillhouse Farm. So which was the original *cair-vre? We park opposite the Carfraemill hotel. According to the Ordnance Survey Name Book, the inn which preceded it was on the site of Carfrae Mill. We walk northwards up the road, bare sheep-dotted hills rising to our right beyond Hillhouse, and ploughed and grassy fields to our left surrounding Carfrae Farm. 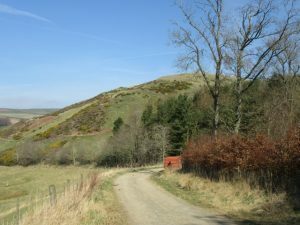 Rising steeply ahead is the hill topped by Hillhouse fort. 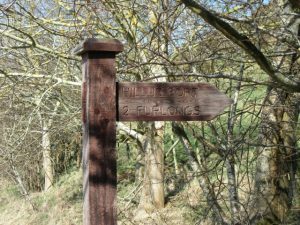 A wooden signpost reads ‘Hillus Fort – 2 furlongs’ – Hillus is presumably a variant of Hillhouse. We climb up through tussocky grass to the fort. It is very impressive. Grass-covered ramparts still stand to the north and southwest, though quarrying and water erosion have wreaked considerable damage. The view is stupendous, running down the Leader valley to the Eildon Hills some 22km away. From Hillhouse fort we can see the fort site at Carfrae. It is beyond the farm steading, higher up the same hill, in the far corner of a field. Beyond are trees which mask a steep drop. Ramparts, now almost completely ploughed out, once cut off the end of the ridge. This fort was likewise strategically placed, overlooking the main north-south routeway. So which hill might be the original *cair-vre? The main bearer of the Carfrae name today is Carfrae Farm. The fort known as Carfrae is on the same hill as the farm. On the other hand, Hillhouse fort is more impressive and therefore more likely to have been singled out for a name. In the past the Carfrae name had wider resonance. It appears in charters of the middle ages as the name of lands. Rev. Archibald Allan in his History of Channelkirk cites a charter of c. 1196 which sets out the boundary of the ‘lands of Carfra’. (Edinburgh 1900, 404, on archive.org) The boundary ran up the Kelphope Burn on the east and the north-south road on the west, thus enclosing both sites. This suggests that the name Carfra was applied to a landholding which included both fort sites. If so, it is possible that Hillhouse fort was the original *cair-vre. 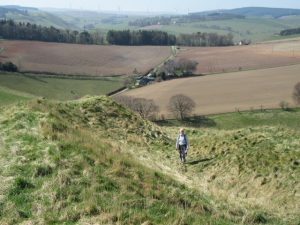 Alternatively, it perhaps once had a name more distinctive than ‘fort hill’ – perhaps a name beginning with *dun (from Gaelic dùn or Northern P-Celtic dūn ‘fort, place of refuge’). Note: Thanks to Alan James for his advice. The final result is my responsibility.